Heirloom Intermediate Bearded Iris "RED ORCHID"
The first time this heirloom iris unfolded its early blooms at home, there were not enough superlatives to describe it. It was given to me as I. X rothschildii which apparently is one of those natural-hybrid things of pallida-variegata origin, given a specific name in error. But as much as the name on the label the plant came with held some fascination, the plant after some research proved to be 'Red Orchid'. It has great Historic form with its hangdog falls, and gives the impression of an earlier 19th century Hybrid, this has a lot to do with its close to species pedigree, so its form is right on the money. The Sass 1934 price list calls the colour violet carmine (Ridgway colour), I myself would call 'Red Orchid' the colour of a very good port. 'Red Orchid' is one of eighteen Intermediate Irises registered by the Sass Brothers in the nineteen thirties and a good proportion of their intermediates proved to be rebloomers, unfortunately 'Red Orchid' is not one of them. I recently purchased a catalogue, 'Cooleys Gardens' 1938, and on page 42 (just click on the page displayed below) under the heading "And now Indian Summer in the Iris Garden" you can see it lists 'Red Orchid' and many other Sass Brother's introductions, also listed are several introductions by Eric Nies,of Spuria breeding fame, also featured two introductions of Clint McDade of Tennessee who was recorded in the 1939 Checklist as "An Iris breeder particularly fond of Autumn-blooming Irises. Has raised some seedlings and imported many European varieties." Mr McDade was the author of the book 'Rainbow's end, or, Journeys of an iris lover, 1932 season' . Irises grown by Robert Wayman, Bayside New York, Irises 1936. RED ORCHID A new Sass rich red toned intermediate, the reddest of all to date. Velvety falls with deep orange beard. 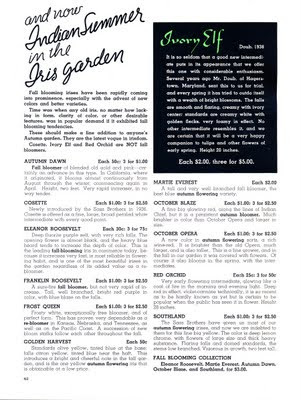 Maple Road Gardens, Jacob Sass, Omaha, Nebraska, Sass Iris List 1937. As a matter of interest The Greater Omaha Iris Society has a great web site which includes information on the Sass Memorial Gardens. Available from Woottens of Wenhaston, Suffolk, England. A big Hat Tip to Phil Edinger and Mike Unser for their candid observations and discussions in this regard.